Since the first of the year, Historic Downtown Branson has been abuzz with construction activity. Several infrastructure and renovation projects have been on an accelerated schedule since Jan. 3 to help make downtown even more friendly for Branson’s guests before the busy summer months. Phase 1 of the downtown streetscape project involved portions of South Commercial Street, College Street and Pacific Street and was completed about a year ago. The project replaced in-ground infrastructure, built new sidewalks, created new common areas, provided benches, installed better lighting and rebuilt the streets. Phases 2 and 3 continue the progress of Phase 1 and cover even more ground. Both are expected to be completed during the first half of 2017. One of the most exciting parts of the downtown streetscape project is the construction of the new Liberty Plaza. The open-air plaza occupies half a city block and is located at the corner of Veterans Boulevard (Business U.S. 65) and Pacific Street. The $4 million project will feature a new parking lot, a trolley stop, a large public restroom facility and a performance stage with a fountain backdrop. A new rock wall separates the park from Veterans Boulevard and also widens that road slightly and provides a larger corner for turning onto Pacific Street. The new restroom facility is expected to open before Memorial Day 2017, and the entire plaza is expected to be completed by early Summer 2017. Phase 3 of the streetscape project covers Commercial Street from Pacific Street to Atlantic Street, including the busy intersection of Main Street and Commercial. Several major sections of this project have already been completed, and the last segment between Main Street and Atlantic Street is scheduled for completion by May 2017. Visitors are able to enjoy the rebuilt parking spots, the brick-paved crosswalks, new lampposts, larger common areas, benches and wide sidewalks. The final section of the streetscape project is Phase 4, which is expected to begin in Winter 2017/2018. Phase 4 will renovate the remaining section of Commercial Street, as well as segments of Main Street and Sycamore Street. Downtown Branson encompasses the area roughly between U.S. Highway 65 and Lake Taneycomo. This includes the historic district centered around Main Street, the Branson Convention Center and the Branson Landing development. Downtown is home to more than 200 retail shops, several dozen restaurants and a diverse selection of hotels, inns and B&Bs. Downtown is also served by a free trolley system that provides year-round transportation for visitors and residents. 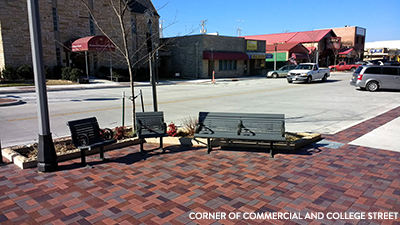 Make sure to visit Downtown on your next visit to Branson and see all the renovations being made!